Hello friends! 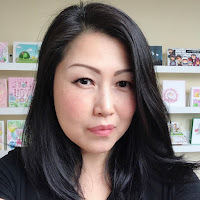 I'm so excited to share that MFT will now be carrying a new line of stamps illustrated by Stacey Yacula. I'm a huge fan of Stacey's work, her illustrations are always sweet, so endearing and fun to color. 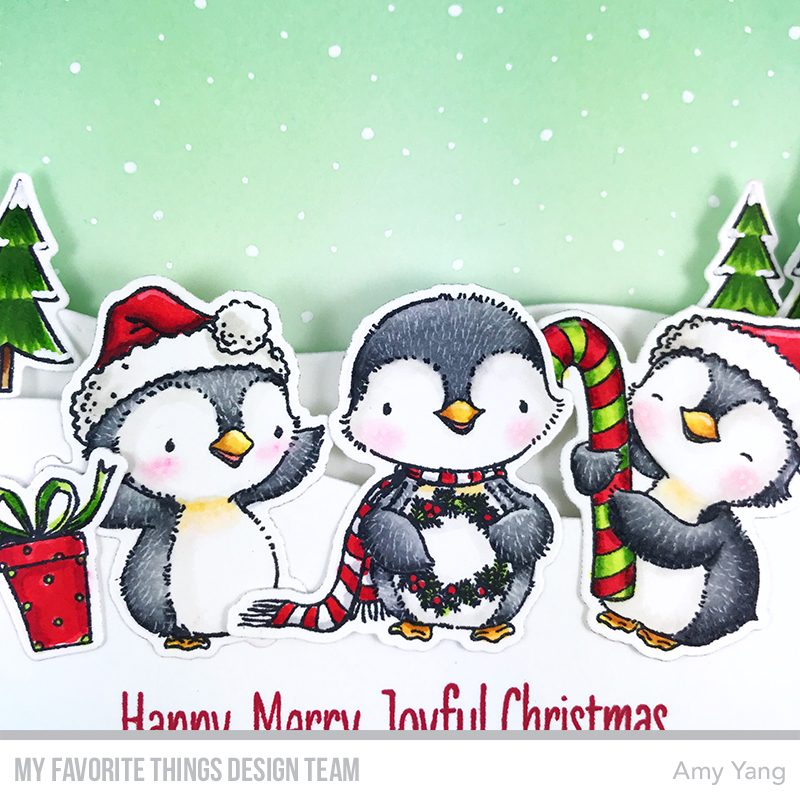 Today, my card features the new Sweet Holiday Penguins stamp set illustrated by Stacey Yacula. It will be available for purchase along with the new Card Kit - Festive Flamingos on October, 23 10AM EDT. To begin, I Copic colored the adorable penguins from the Sweet Holiday Penguins stamp set and the trees from the BB Beast Friends and cut them out with the coordinating dies. I added fur like the texture on the penguins using a thin white gel pen. The front panel was ink blended with Distress Oxides. I added tiny dots to create snow with a white gel pen. The snowy hills were die-cut with the Snow Drifts Die-namics. 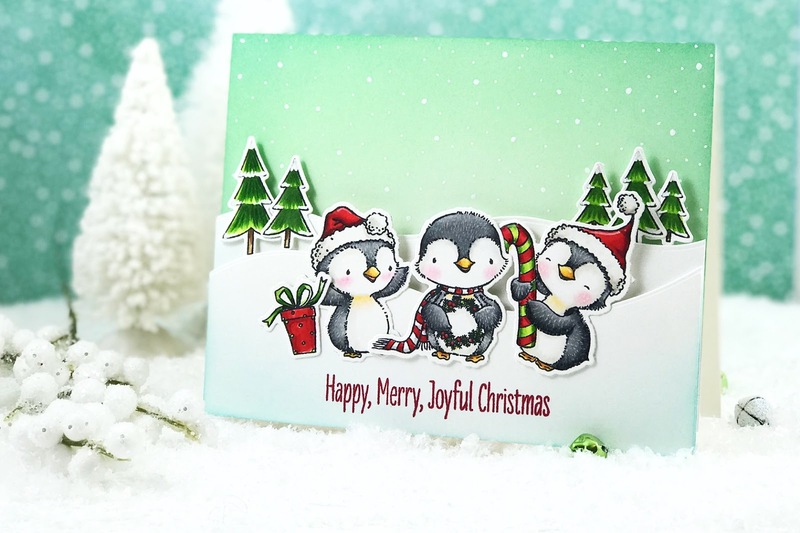 I lightly ink blended the front hill panel with Distress Oxide and stamped the sentiment from Sweet Holiday Penguins stamp set with the Electric Red Premium Dye Ink. To finish, I foam mounted the hill panels and added the images as shown. Thank you so much for stopping by! 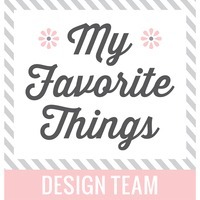 I hope I'll see you again tomorrow for my second project using the Sweet Holiday Penguins stamp set. 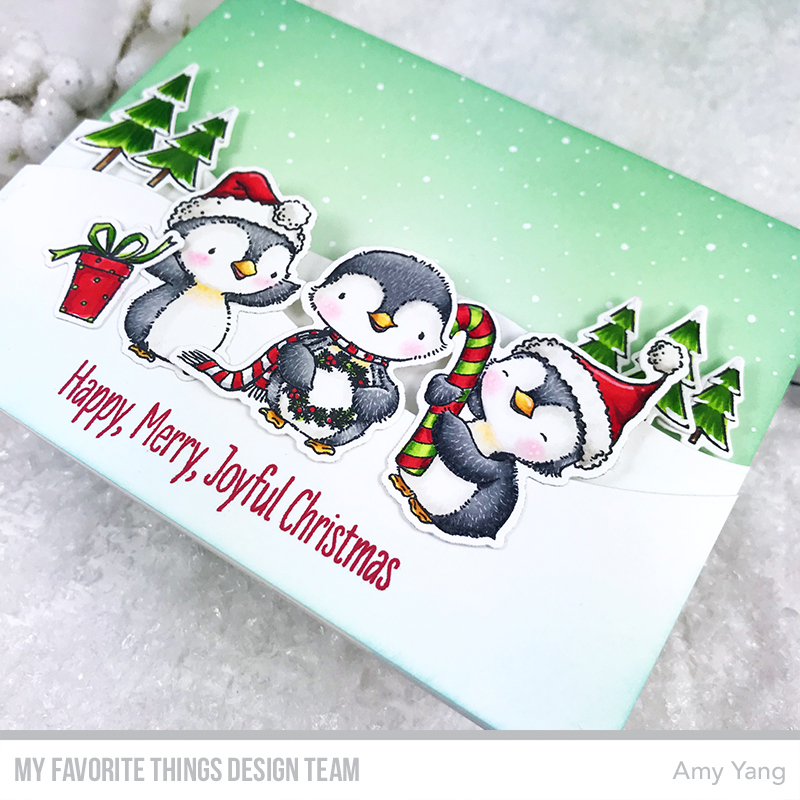 Visit the MFT Blog for more information on the Sweet Holiday Penguins stamp set and the Festive Flamingos Card Kit. Those penguins are just adorable, and your card is beautiful! Love the penguins and your card. Just wonderful! THese little guys just melt my heart. Beautiful card! These are the cutest penguins I've seen and your card is fabulous!!! Beautiful card. I agree these are the cutest penguins I have seen too. Such a sweet card. I love the sentiment. Super adorable card! Love the texture you gave to the penguins. Penguins... always a favorite, and you've done a superb scene. Your penguin card is so darn cute!!! I love the mixture of different inks and dies you used, very creative. This is such a cute card and great sentiment choice.